In honor of said mental and actual vacation (and since it was queued up on my Netflix list and was in the mailbox when I got home), tonight we’re on to another Hepburn in Europe: Katherine, this time, and the city is Venice. Summertime was released in 1955. Katherine Hepburn and Rossano Brazzi (both pictured at left) star; it was directed by David Lean. The movie was filmed entirely in Venice—it is absolutely gorgeous. The location and the filming are beautiful; the story is hauntingly melancholy. 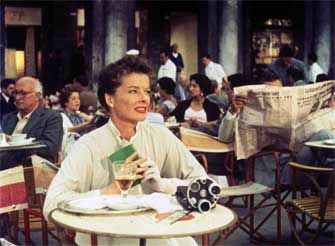 Katherine Hepburn is Jane Hudson, a lonely middle-aged secretary who has finally saved enough to come to Venice on holiday. Her dreams of Venice are perhaps somewhat unrealistic—while she wants to see everything, what she really desires is something—some one—to sweep her off of her feet and make her feel included. The script and the star both manage to excellently portray the mute suffering (though quickly hidden by tense laughter) of one who feels the odd one out. (Honestly, this part of the movie was rather excruciating to watch. Who hasn’t felt this way? It was like being in high school all over again.) After an extremely awkward and unsuccessful attempt to include herself in the dinner plans of her fellow pensionnaires, she reluctantly embarks upon her Venetian adventure alone. While at the Piazza San Marco, she attracts the attention of Renato de Rossi (Rossano Brazzi), an antiques dealer who completely unnerves her with his very open appreciation. She becomes terribly nervous and immediately retreats in confusion. The next day she stumbles upon an antiques shop and is entranced by a beautifully glowing ruby-red goblet in the window. The antiques shop is, of course, owned by the mysterious gentleman whose admiration so discomfited her the previous night. After the introduction of the red goblet, touches of red begin showing up in the previously rather brown/grey neutrals of her wardrobe, culminating with this gorgeous red shoe. Spoilers ahead: (highlight to see) I thought the ending completely horrible. Mr. Wonderful turns out to have an estranged wife and several children—as a result of this information, after a few glorious days, she decamps resolutely for home in Akron, Ohio. It’s miserable—she is so completely happy, and so obviously unfamiliar with happiness, that when her rather strident morality clangs in to close off, well, everything, it seems like some sort of emotional abuse. Made me hate the conventions by which she was defined and constrained. I have no problem with the occasional sob-fest flick: I get that the problems of two little people don’t really amount to a hill of beans; I’m well acquainted with she who loved Brahms, Beethoven, and the Beetles; I always cry over the two young corpses in the Verona crypt. I know that movies work on multiple levels and that requiring a neatly-tied off happy-ending is limiting. I get it. But the reason the affair was given up wasn’t worth the sacrifice. The wife was completely out of the picture before the fact, we are merely left with two people in love, haphazardly and carelessly throwing it away. I loved the setting and I think the Katherine Hepburn’s character was incredibly well-acted (Leonard Malthin says this is one of her best roles) and her actions and responses are understandable and realistic, Brazzi is dreamy and completely right as the mysterious Italian beau, and the minor characters are intriguing…but I didn’t quite love the movie. And I want the happy ending. my favorite movie – possibly of all time! Yes, it really was quite wonderful. I’m thinking about a re-watch!